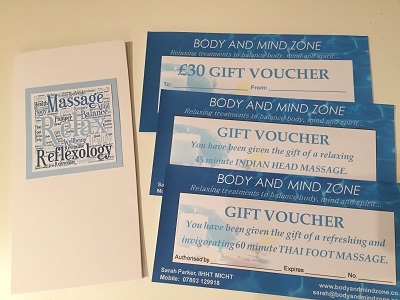 Gift vouchers are the ideal gift for any special occasion - Birthdays, Christmas, anniversaries, Mother's Day, Father's Day, Valentines Day, new parents, or even as a thank you! ● Includes a free card and envelope. If you would like the voucher to be sent directly to the recipient, please include instructions during the payment process and state this in Instructions from buyer, including your personal message to go with with the voucher, (or email or phone with details if you prefer). A full treatment of all the reflexes to provide an overall relaxing treatment, including any problem areas if relevant. A full treatment using the traditional Thai methods. Uses the palms, fingers, thumbs, knuckles, and traditional Thai foot massage stick. Leaves you feeling relaxed, yet energised and invigorated. Great for tired feet! A stimulating and refreshing massage of the arms and hands and includes techniques taken from shiatsu and reflexology. A relaxing and rejuvenating massage of the face, head, neck and shoulders, helps improve complexion and reduce lines and wrinkles. A wonderful treat - feel tension melt away! See and feel the difference in the complexion, tone and condition of your skin with a course of treatments to fight the ageing process! With this package you receive eight treatments for the price of seven! Enjoy a 30 minute Indian Head massage, with or without oils, then relax on my comfortable couch while you have a 60 minute reflexology session. Enjoy a 30 minute Indian Head massage, with or without oils, then relax on my comfortable couch while you have a 60 minute Thai Foot Massage. Enjoy a 45 minute Oriental Face massage, then relax for a further 15 minutes while you have a soothing foot massage to relax and refresh tired feet. Lie down and enjoy a 45 minute Oriental Face massage, then relax for a further 45 minutes while you receive a refreshing Thai foot massage - the ultimate stress buster! Enjoy one and a quarter hours of pampering combining two treatments of choice (to be chosen by recipient), with one 45 minute treatment and one 30 minute treatment. Enjoy 90 minutes of pampering combining two treatments of choice (to be chosen by recipient), either two 45 minute treatments or a 60 minute and 30 minute treatment. Enjoy an hour and three quarters of pampering combining two treatments of choice (to be chosen by recipient), with one 60 minute treatment and one 45 minute treatment. If you prefer to give the recipient the choice of which treatments to spend their voucher on, you can simply purchase a voucher for the value you want. If the amount you require is not here, then feel free to phone me, and ask for the value you prefer! Therapies take place in the therapist's clinic in Springfield Crescent, Northam, just outside Bideford in North Devon. Mobile appointments are not available. Therapists working hours are Mon. to Thurs. 9.15 am to 6.00 pm and Friday 9.15 am to 2.45 pm, so vouchers will need to be redeemed for appointments within these times. There are some conditions where it would be inadvisable to receive a treatment. If the person you are buying the voucher for is currently taking medication, or has a long term medical condition it may be necessary for them to check with their GP before having their treatment. Please feel free to call or email me for advice. Clients 16 years of age or under must be accompanied by a parent/guardian and have written consent. Only valid when signed and dated by an authorised signatory of Body and Mind Zone. Change will be given in gift vouchers when a purchase is made for less than the face value of the voucher. Vouchers cannot be used in conjunction with any promotion, offer, or discount. Vouchers can also be used for any other package or treatment up to the same value, but are not valid for workshops and classes. 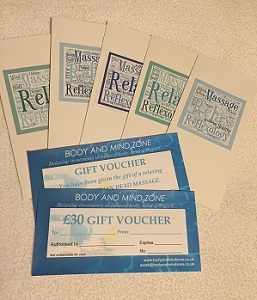 Vouchers only cover appointments taking place in the treatment room in Northam, near Bideford, North Devon.